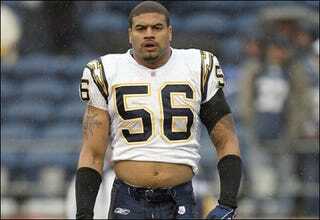 Merriman was hit with a paternity suit this week, in an odd case in which he's admitted the unborn child is his. And before you ask, don't worry; Tila Tequila has not reproduced. The kid's not even born yet, and already Tiffany Horne has made a paternity filing against the Chargers LB. Which is strange, because he's already announced on Twitter that he's going to be a father. She's a great friend of mine and has been for almost six years now," Merriman said. "There's no denying of any kind of paternity. For this to be even taking place is a shock." Now, I have a lot of female friends of six years, and I've gotten very few of them pregnant. But that aside, it's pretty clear that Horne is just covering her bases financially. Despite Merriman's lawyer saying it's "a standard paternity case," Horne's begs to differ. It's not a paternity suit," said Horne's attorney, David Schulman, "It's between two people who have an agreement." Translation: we want it in triplicate that Merriman has to provide for her and the child for the rest of their lives. You can never be too careful.